Amazing Socks, online at AmazingSocks.com, is your destination for designer and brand name socks. Amazing Socks sells socks for men, women, boys, and girls. Amazing Socks carries brand names including: Calvin Klein, Dr. Scholl's, Travelsox, WrightSock, Wigwam, Jockey, GoldToe, IBEX, Thorlo Socks, Champion, and Fox River Socks. Amazing Socks also carries diabetic socks, dress socks, running socks, tennis socks, and walking socks as well as socks for big and tall men. Amazing Socks has accessories including shoe pockets, ski and pole carriers, bottles, gear bags, and arm bands as well. RetailSteal.com has the best Amazing Socks coupons, Amazing Socks discounts, Amazing Socks coupon codes, and Amazing Socks promo codes. Shipping and handling rates at Amazing Socks depend on the pricing of your purchase and your shipping destination. Free shipping is offered for orders over $57.95. See website for full details, exclusions may apply. Save up to 75% on clearance items when shopping at AmazingSocks.com. Click to save. Free shipping on orders $57.95 and over when shopping online at AmazingSocks.com. Click to save. Save 30% on World's Softest socks when you shop at Amazing Socks. Save 20% on Drymax socks at Amazing Socks. Click link to shop now. 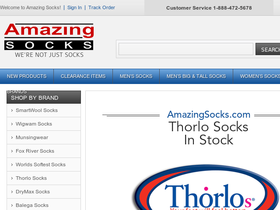 Buy 3 pairs, get 1 pair free on Thorlo socks from amazingsocks.com. Shop now and get great deals! Use this promo code at Amazing Socks and receive 10% off all thorlo socks and also a buy 3 get 1 free. Use this coupon code at Amazing Socks and receive free shipping on all orders over $25.